This restaurant has no menu, rarely is English spoken inside and the food is confusing, which is probably why most guides to eating in Brixton ignore this restaurant. 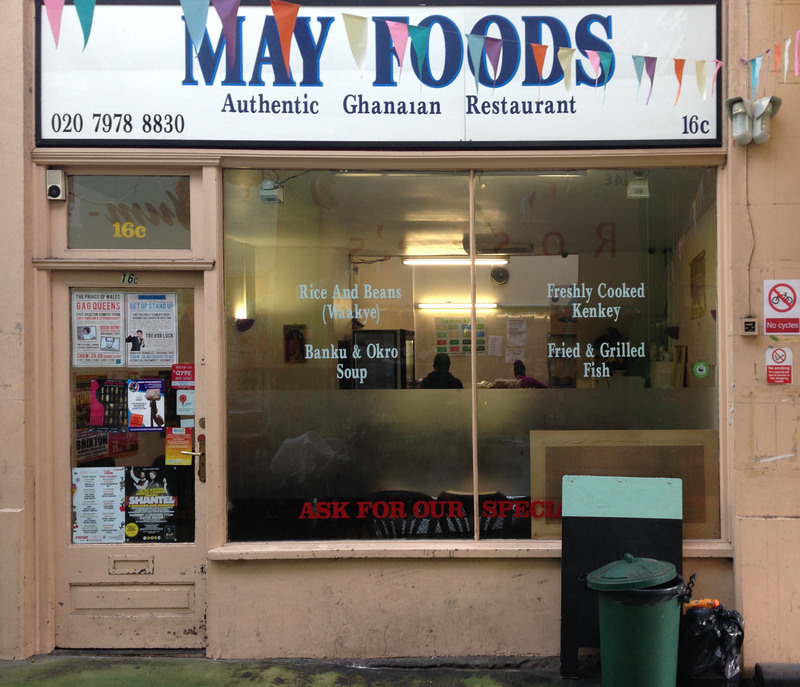 It serves Brixton’s West African community and it can be a bit intimidating but everyone is friendly and helpful. We decided to take our 20 year old trainee midwife guest right out of her comfort zone and to somewhere she would never have entered alone. This was really a test of whether a complete novice could cope. She did really well so now more intrepid Brixtonians need to step inside. If you are not lucky enough to be travelling to Ghana then this is the next best thing. Banku is cooked and fermented corn and cassava dough. It has a strange slightly yeasty taste and comes as a ball of something like greyish mashed potato. Kenkey is fermented corn dough and comes wrapped in leaves and is a more solid consistency. It is like a sourdough dumpling and so the easiest way in to the starchy part of a meal. Fufu is usually pounded cassava and plantain and you eat it by pinching of a bit, dipping it into the sauce and swallowing whole. It looks more gelatinous than the other two in this list and we can’t comment on the taste because we have not yet been brave enough to attempt it. With each type of carbohydrate you can choose meat or fish or stew (usually tomatoes and something else – we have never asked). Sometimes this is very spicy but on our last visit was just really rich. But for the faint-hearted they also sell Jollof rice, which is a sort of colourful and spicy risotto. The restaurant is open during the week and on Saturday but only until 6.30 but you can get a takeaway. The main carbohydrate is sold in plastic bags, which is authentic, as this is just how it is sold on the streets of Accra and Elmina. We ordered two lots of Banku, stew and fish and meat and a jollof rice with fried fish. Those eating the Banku get a stainless steel bowl full of warm water and some liquid soap as this meal is eaten with your fingers. The Jollof came with cutlery.. I only got one portion of Banku and I did manage to finish it this time. Pulling bits off and dipping them in the stew was relatively easy, if a little messy and sticky. The fish though was taxing as it was very hot, so they took pity on me and gave me a knife and fork. 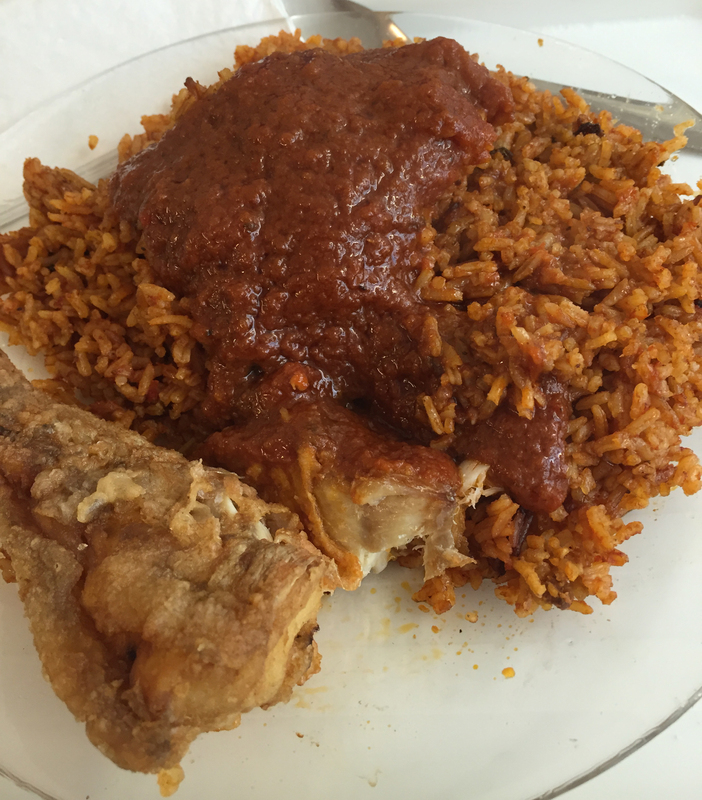 The Jollof was tasty, not too spicy and went well as a foil to the fried fish. The meat was a little tough but our guest ate nearly all of her meal. We were really pleased as she is an Edinburgh lass who doesn’t like spicy, has never eaten any African food and for whom exotic is pizza. Now she can go home with something to remember. The entire meal was inexpensive at £15 – it would be hard to spend a lot of money .. We didn’t have any drinks but there is water and other soft drinks available.